It's an iconic picture from the second world war. Lance Wade, an Amercian pilot from Texas, looking back over his left shoulder while sitting in the cockpit of his RAF Spitfire. 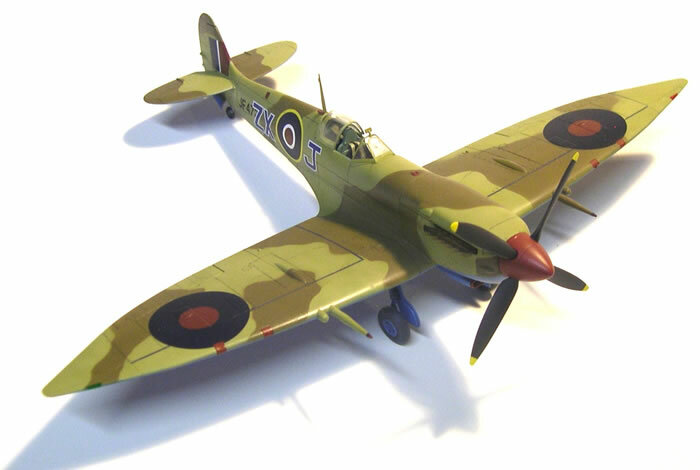 I have wanted to build a model of this plane for years. Trouble was, nobody seemed to know what the rest of it looked like. 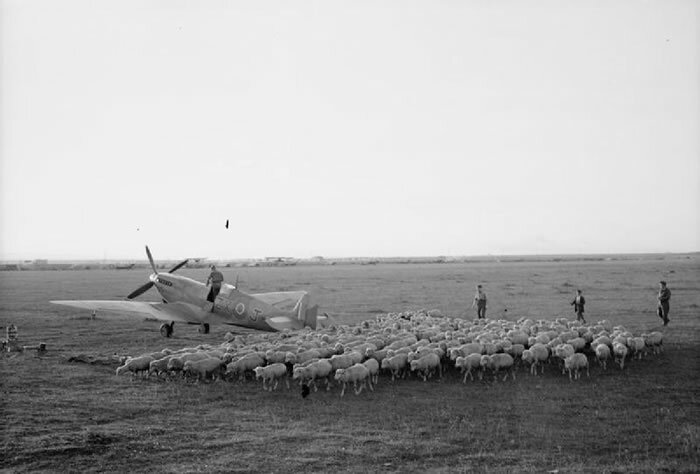 Originally I thought this picture might be of Wade in his Spitfire Mk IX EN186 from North Africa in the Spring of 1943. I was wrong. The Imperial War Museum gives the date for this picture as 12 November 1943. 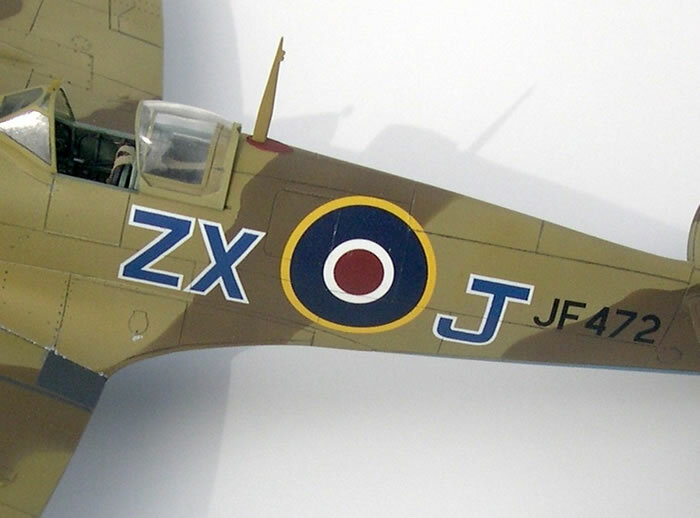 According to Aces High (Chritopher Shores) Wade was flying a Spitfire Mk VIII with 145 Squadron with the code ZX-J and the serial JF472 at this time. 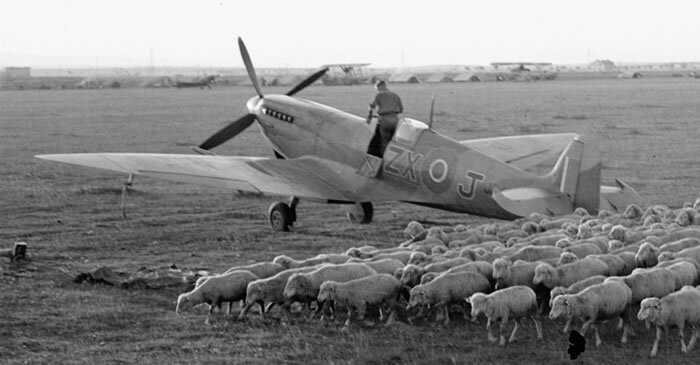 While trolling the IWM website (when they recently changed their format) I came across a picture of a Spitfire Mk VIII with the codes ZX-J amongst a heard of sheep. Initially I though the aicraft in the picture might have belonged to S/L Neville Duke. Duke is known to have flown three ZX-Js in 1944 (acording to several sources). However, the date given for this photograph is 6 November 1943. 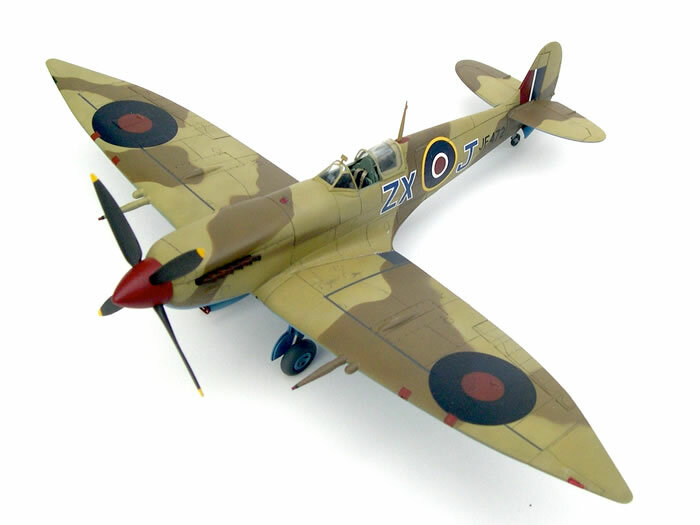 The time, the place, the codes suggested that the Spitfire in the picture was flown by Lance Wade instead. Careful inspection of an enhanced version of the photo revealed that the serial of this ZX-J was JF47x (unfortunatley, the whole serial cnnot be seen). This is enough information to determine that the plane in the picture belonged to S/L Lance Wade during the end of his tour with 145 Squadron. Wade made 5 claims in JF472. On 2 October 1943 the squadron leader claimed 2 FW 190s as destroyed and on 3 November he claimed 3 FW 190s as damaged. Recent research suggests that one of his 2 October claims should be downgraded to “damaged”. In contrast, on 3 November one of the FW 190s was actually destroyed. All of the afore mentioned FW 190s belonged to Slachtgeschwader 4. In November Wade learned of a promotion to Wing Leader and a staff position with Desert Air Force Headquarters under Air Vice-Marshall Harry Broadhurst. 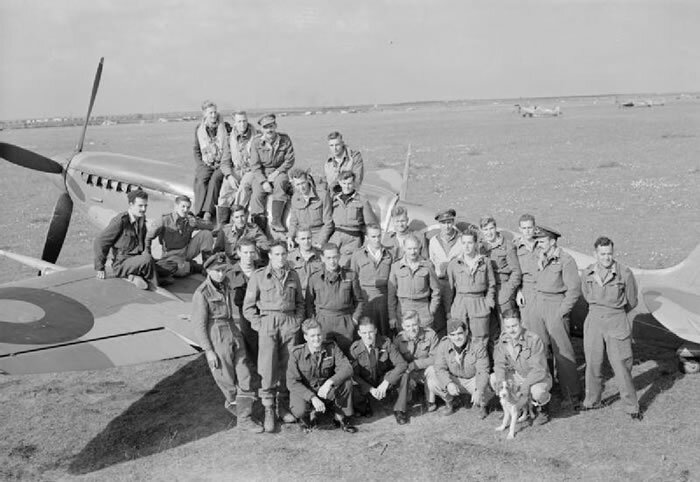 The picture of him in the cocpkit, and a picture of him with other pilots huddled around a Spitfire VIII were taken as part of his farewell to 145 Squadron. 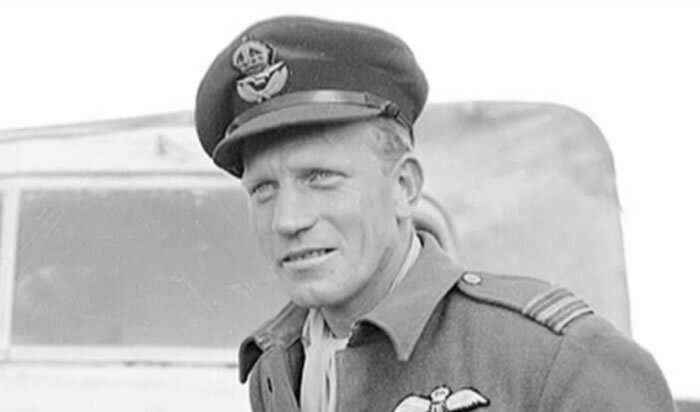 Tragically, Wade was killed in the crash of an Auster on 12 January 1944. At the time of hs death Lance Wade had been credited with 23 confirmed aerial kills (22 + 2 shared), all with the RAF. The story does not end there. Wade turned 145 Squadron and JF472 over to a fellow American, Squadron Leader Oliver C. Kallio from Ironwood, Michigan. Kallio made at least two claims in JF472 (Those Other Eagles – Christopher Shores). The first being a Bf 109 probably destroyed on 2 December 1943 and a second Bf 109 damaged on the 30th. On 18 February 1944 Kallio destroyed a FW 190 (whether or not Kallio was flying JF472 on the 18th has yet to be determined). On 25 February Kallio broke both legs in a crash landing. This left F/L H. S. Woods as acting CO until S/L Neville Duke took over the squadron. Kallio returned to action in June 1944, this time as CO of 417 Squadron. He made no further aerial claims as the squadron was engaged in low level sorties exclusively. “Sandy” Kallio was repatriated (to Canada) in August 1945. Kallio visited Wade's parents in 1946 only to discover that the “Wildcat's” remains had not yet made it back to Texas. Lance Wade was finally laid to rest in Recklaw that summer. 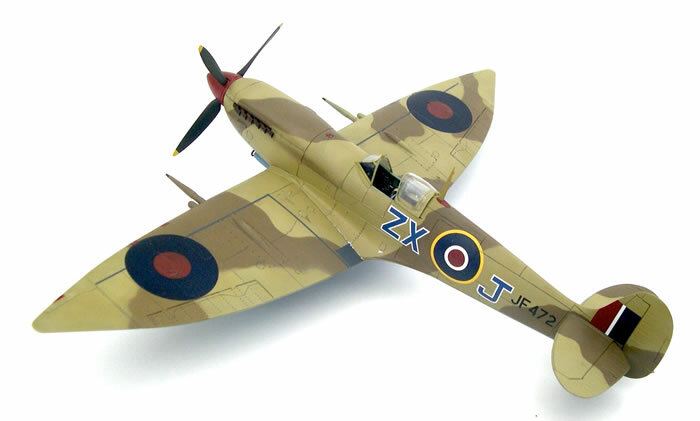 I used the (maligned) Hasegawa 1/48 Mk VIII to depict Wade's last Spitfire. The only additional parts being Ultracast's exhausts and seat. 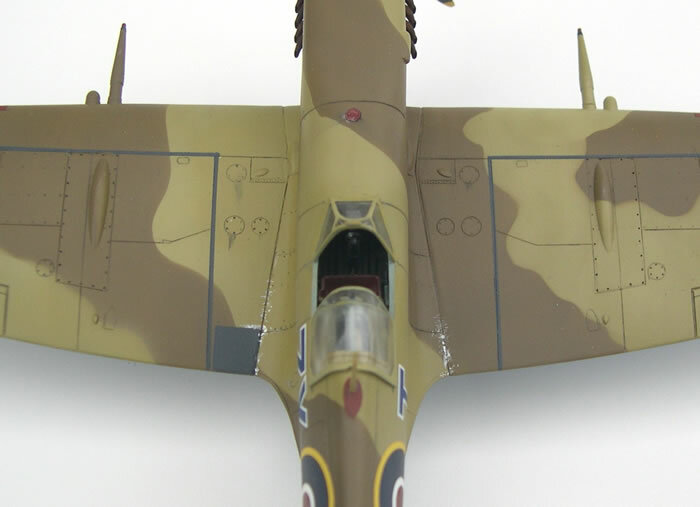 Some items on the wings were omited in order to depict a wartme Spitfire and the diagonal line of the gun cover was filled, sanded, and rescribed. 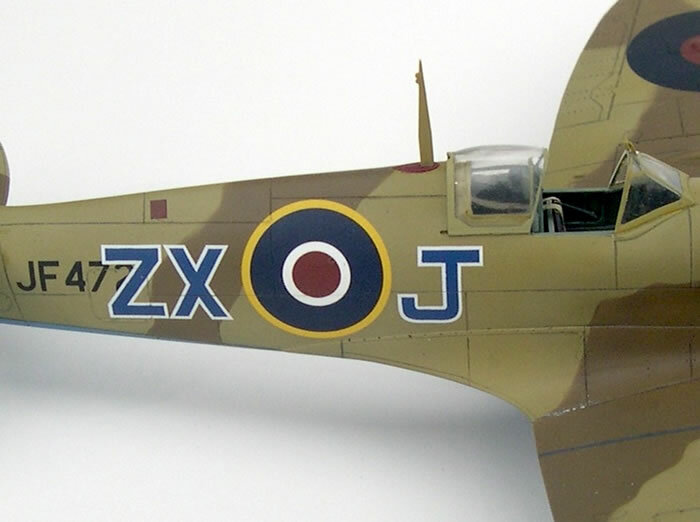 When I discovered the markings I made a call to Jennings Helig and we decided in a matter of minutes to start our own decal company (fündekals.com) and that Wade's Spitfire VIII would be one of the intial releases. At first we were certain that the codes were Roundel Blue with white outline. This was a fair assumption … but wrong. Other decal companies have come to the same conclusion regarding 145 Sqn code's colors while some others (Hasegawa included) have depicted 145 Squadron codes as Roundel Red, which is also not right. 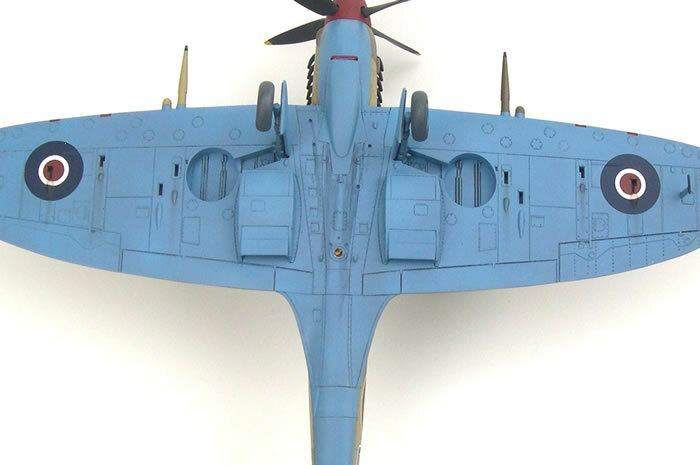 After a very insightful discusion on another modelling website we were educated to the fact that the codes for 145 Squadron were some other blue. A color photograph of a PFT Spitfire Mk IX led us to RAF Deep Sky. In b/w photographs Deep Sky can appear Dark Blue or Dark Red depending upon the type of film and/or flilter used. Camo colors are Model Master Enamels straight from the bottle, but the lower surface Azure Blue is a custom mix which I cannot remember the formula for (I just kept adding blue, or red, or white until it looked right). The finish included several coats of future and folowed by two coats of Vallejo Matte (which has won me over). The decals were applied without any prior trimming.